ANN ARBOR – Lake Michigan’s prey fish population grew in 2012, but not enough to put aside concerns about the potential for collapse, according to federal scientists who conduct annual prey fish assessments on the Great Lakes. Findings from 2012 acoustic surveys and bottom trawls, conducted by staff with the U.S. Geological Survey Great Lakes Science Center in Ann Arbor, show prey fish populations continue at an all-time low; the slight uptick proved statistically insignificant; and alewife populations, a primary food source for Chinook salmon, remain in tenuous condition. Biomass refers to total volume or tonnage of prey fish. An August 2012 acoustic survey of Lake Michigan found 31 kilotons of prey fish, up from 21 kilotons in 2011. It was an average year, according to Warner, and the increase is due to a large 2010 alewife year class that survived and grew. Another increase is likely in 2013 resulting from alewives born in 2012. But Warner and others suggest that those increases are not likely to offset the potential for a collapse. Other conditions exist that have scientists concerned. The alewife population is now dominated by two-year classes where there were once many. The oldest fish found was 5 years old and there was just one. Nearly all of the rest were born in 2010 and 2011. “Most of the alewife biomass was made up of 2-year old fish,” Warner said. 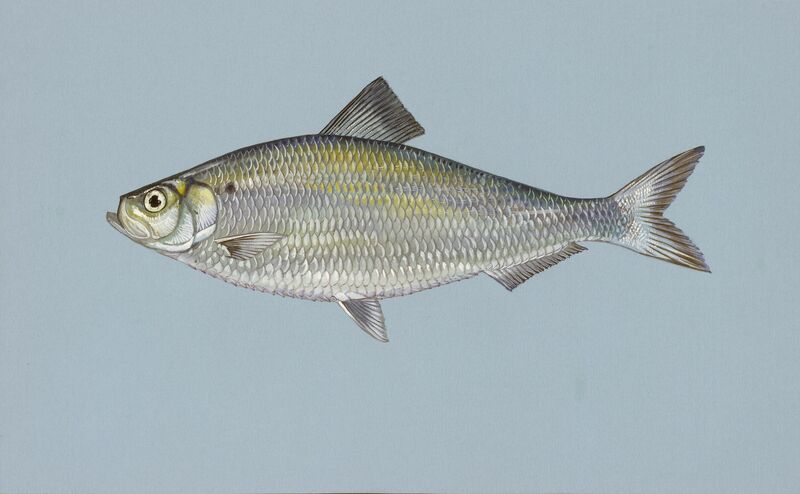 They made up 60 percent of the alewife biomass and almost 90 percent of the fish age one and older. The physical “condition” of alewives has also declined, according to Chuck Madenjian a research biologist with GLSC and the co-leader for annual bottom-trawl effort on Lake Michigan. That means they are less plump than they were and less energy-rich. Alewife growth rates have also declined and those that remain are smaller. The shrimp-like diporeia is an energy-rich food source for alewives. Photo: Great Lakes Environmental Research Lab. smaller and less energy-rich, Madenjian said. 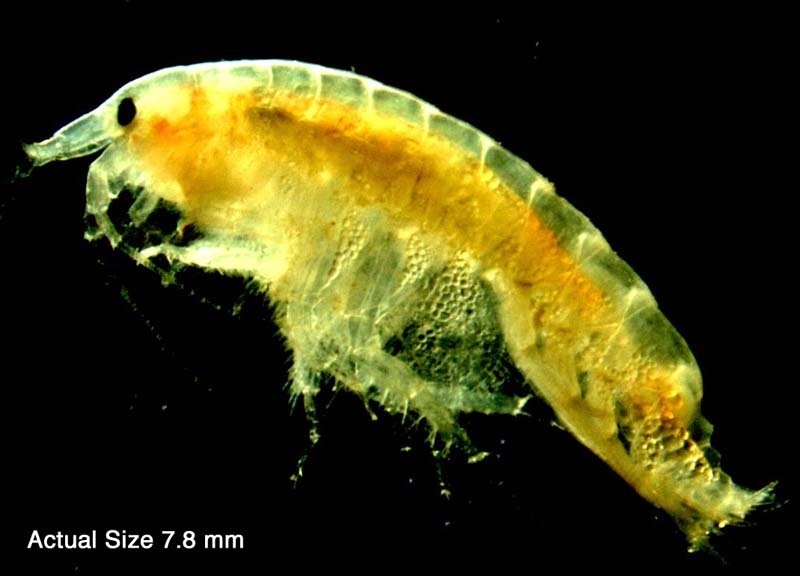 Scientists think that change is due to the disappearance of diporeia, a tiny, energy-dense shrimp-like creature that was an important part of the alewife diet. Their disappearance is thought related to the presence of zebra and quagga mussels in Lake Michigan which filter out important phytoplankton that diporeia feed upon. The exact reason for their disappearance is not known, according to Madenjian, but the outcome is that alewives are less energy-rich and so salmon eat more to meet their caloric needs. There may also be more salmon feeding on the diminishing forage base. Scientists say Lake Michigan gets an influx of Chinook salmon from Canadian waters of Lake Huron and wild salmon from Lake Michigan tributaries. Chinooks also had more food choices in past years. They fed on alewives, bloater chubs and rainbow smelt. But that’s not the case now. Bottom trawls are less effective than acoustic surveys for identifying age zero fish, according to Madenjian, but they are effective for finding age 1 or older fish in the bottom 2-feet of the lake where nets are deployed over a limited area. Those results, however, may or may not be “reliable,” because fish can move deeper or shallower and may be present but not at that depth,” Madenjian said. The 2012 GLSC bottom trawl showed a 20-percent decrease in fish compared to 2011 and most of those were age 2 alewives, the 2010 year class. This entry was posted in Uncategorized and tagged alewife, Chinook Salmon, diporeia, Fishing, Forage fish, Great Lakes, Great Lakes Science Center, Lake Huron, Lake Michigan, Salmon, USGS. Bookmark the permalink. How things change. They first introduced salmon to control the overly abundant alewife population. Now they are worrying about the alewife population not supporting the salmon.